Thursday so it must be Ghana. Fortunately I am now out of Venance’s personal reach, although not his electronic one. Again I have booked a car, a driver and a guide. A driver is waiting with a Toyota Corolla which has seen better days, and those days were many years ago. I guess that it was once a maroon colour, but there is very little of the original paint left and most of the car seems to be unfinished metal. I ask the driver where the guide is. “Michael” he replies, holding his hand out in greeting. “Yes, where is Michael” I reply. It appears that Michael speaks very little English and for reasons he cannot explain the guide has not turned up. This is the first time that my prior arrangements over the internet have gone wrong, which considering the places we have been too, isn’t bad. And this isn’t a disaster. I have a car, of sorts, and a driver. And Michael appears to know where we are scheduled to go. 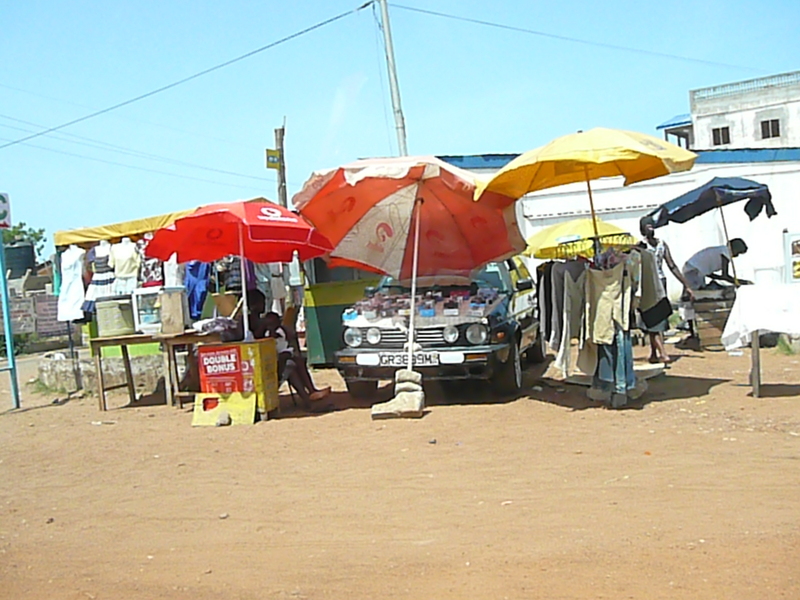 Everything I had read about Accra suggested that it was a huge dirty city with very little of interest for a tourist. I had asked the guide on line, to come up with a place to go where we would see the local villages and how they live and he had suggested visiting the Krobo tribe in a “remote spot” an hour an a half outside of Accra. 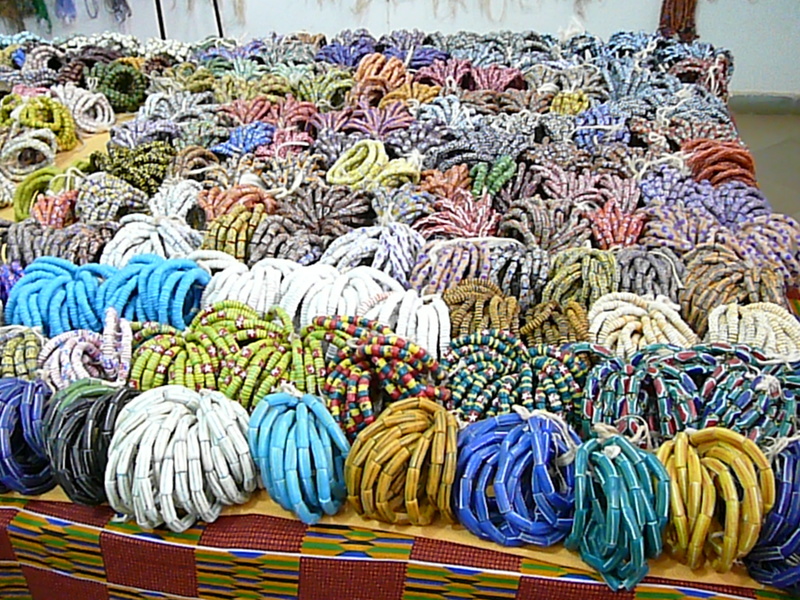 A Krobo family runs a business making beads out of recycled glass and this business supports the family and adds to the income of the Krobo tribe. It sounded like an interesting trip. With some trepidation I get into the Toyota. The inside is much better than the outside (it could hardly be worse) and before we set off I make sure the air conditioning is working – it is. We drive through the outskirts of Accra and I am surprised to see rows and rows of new huge and very expensive houses. There are modern office buildings, trendy apartment blocks and shopping malls. 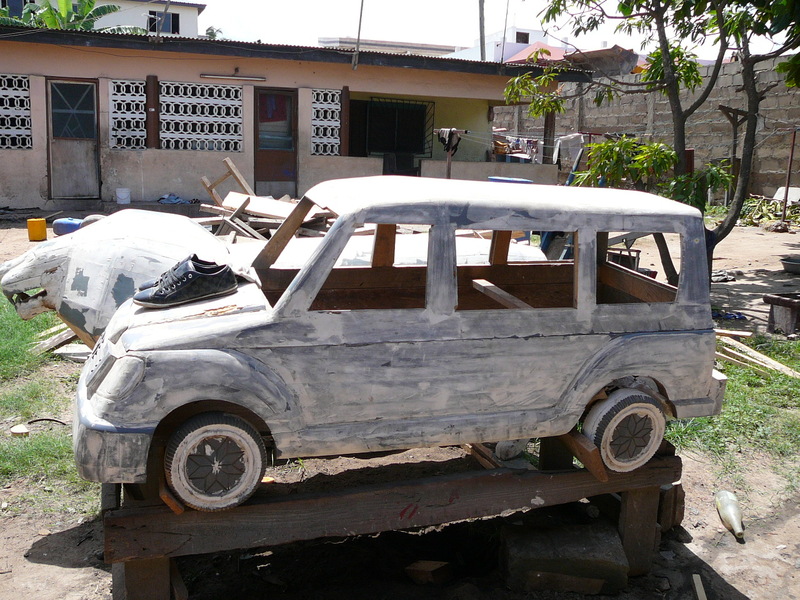 Part of Ghana is thriving. But a much bigger part is not. 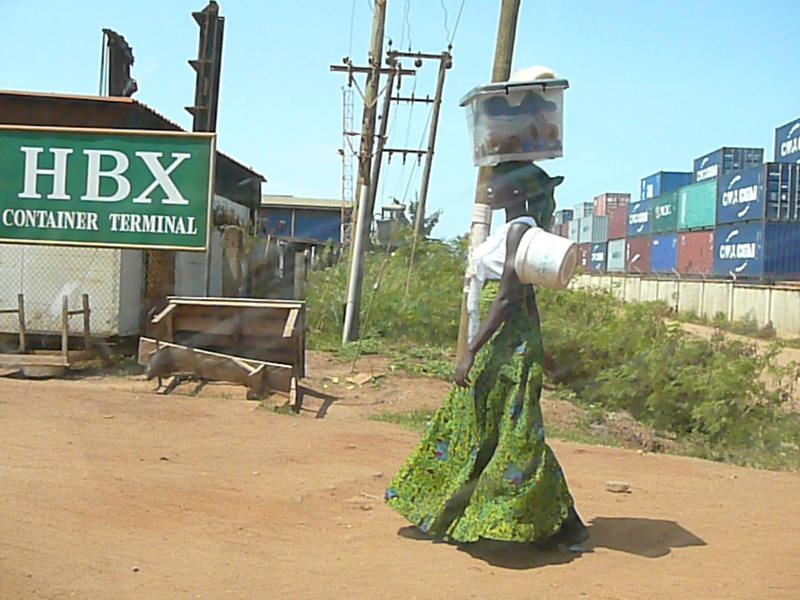 There are still stalls by the side of the road and people carrying their wares on their heads, Ghana may have wealth, but it is a much sadder country than either Benin or Togo. 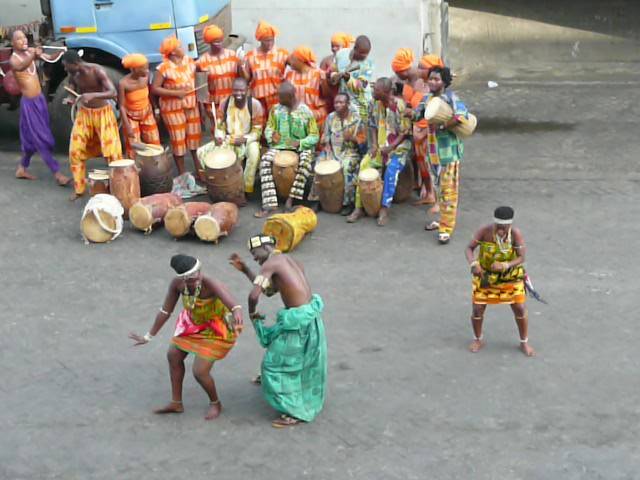 In Benin and Togo there wasn’t these extremes of wealth and poverty. Everyone was poor and making the best of it. Here the huge majority are poor but they are living in the shadows of the wealthy. We travel on huge four lane highways around Accra, stopping to pay at toll booths. The roads are impressive until they come to a sudden stop and you have to navigate the next few miles over dirt roads until the highway starts again. There is no sign of any work being done on these unmade parts. Traffic is horrendous, the highways are jammed. When the highway ends the cars all have to fight for a space on the much narrower unmade sections which brings everything to a standstill. And then the vultures descend, in the form of hundreds of people selling anything from toilet paper, to transistor radios, from sunglasses to water. They seethe round the car pressing their faces and their merchandise to the window. It is truly unnerving, although Michael seems oblivious to it all. We are no longer in the Land of Voodoo. Instead we are in God’s Land. Religion is obviously huge. Almost every car has a sticker proclaiming “Go with God”. Sadly I can only aspire to going with Michael. 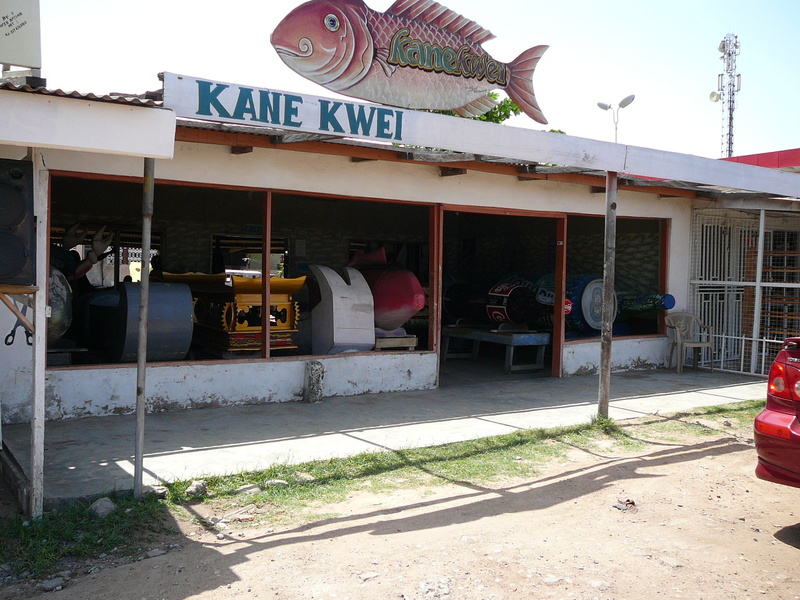 Many of the little shops and stalls that line the streets manage to incorporate God or Jesus into their name. I spot “Jesus is good Pizza”, which says a lot for Jesus but not for the Pizza. Then there is “Hands of God Mechanics” who can presumably fix just about anything. There is also “God is King Haircut”, and I certainly could have used a little divine intervention a week ago. 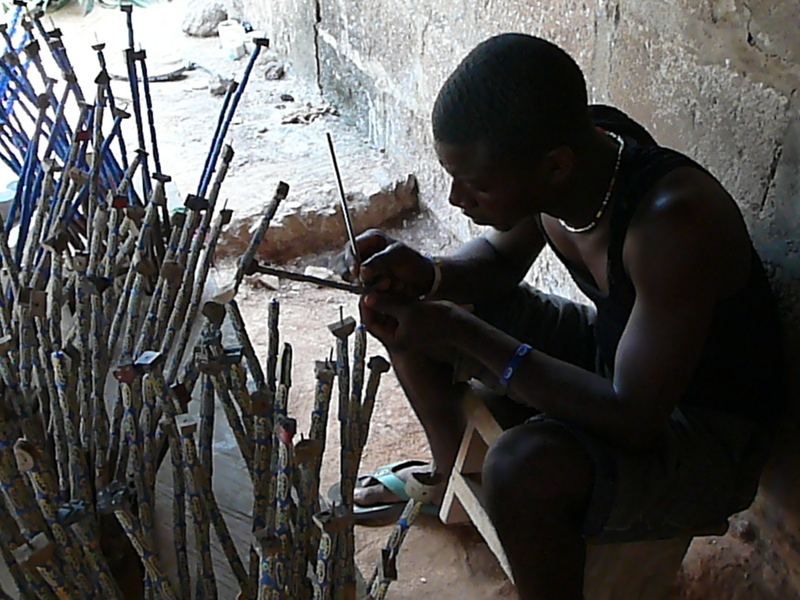 We finally get to the remote spot where the Krobo tribe is based. Sadly it is not remote at all and has been swallowed up by the urban sprawl. But the business is fascinating. 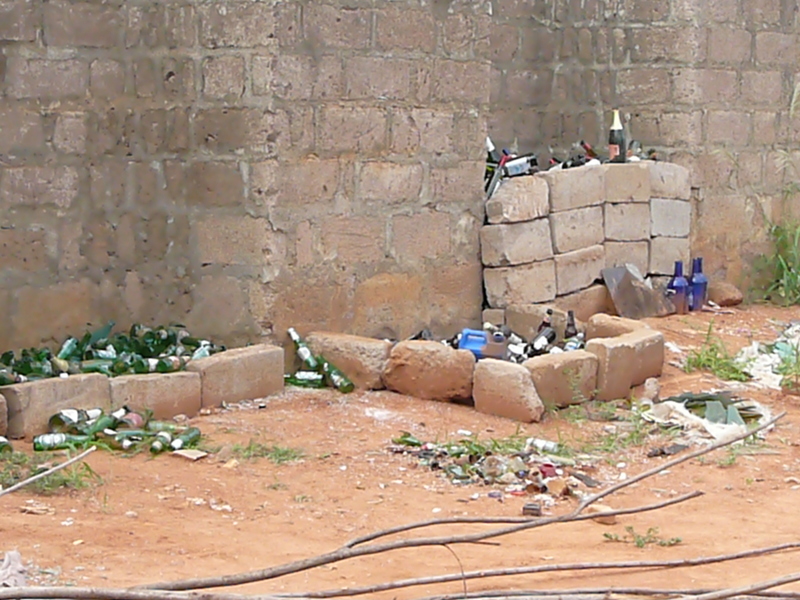 The family collects discarded bottles of all colours plus any broken glass they can find. They then break the glass into tiny fragments, keeping each color separate. 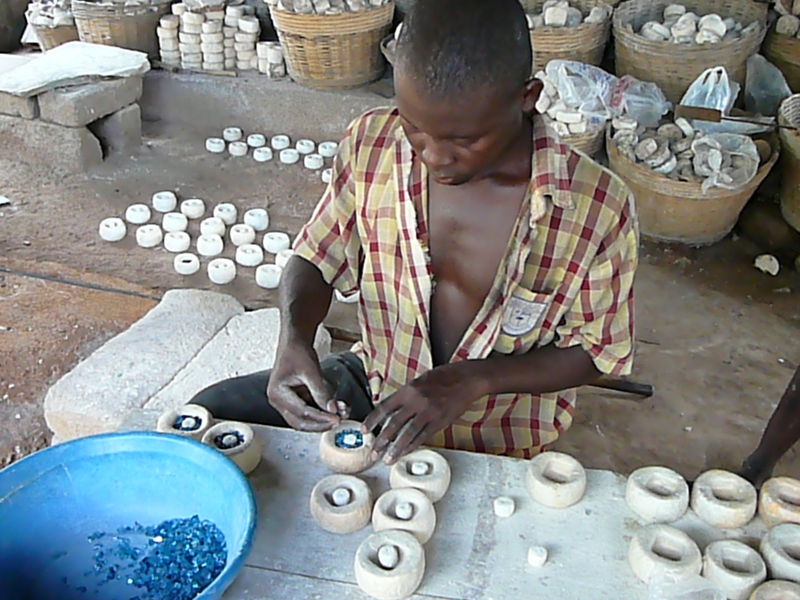 They have tiny moulds for each type of bead which they pack with the glass. 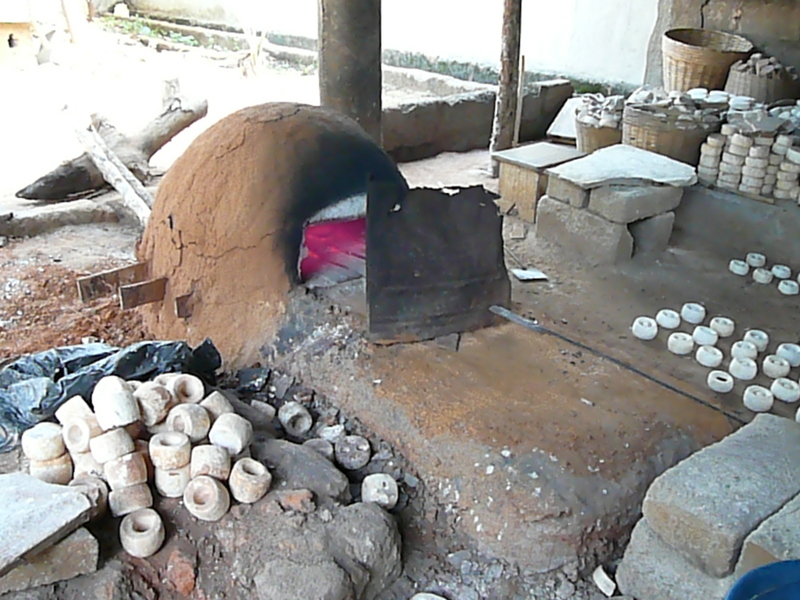 They push the moulds into their home made kiln – a small oven they have made out of clay. There is a door in the front for the moulds and a door in the back for the firewood which heats the kiln. After 40 minutes they remove the moulds. A stick is pushed through the molten glass to create the hole in the bead. When the bead cools it will be the same colour as the original glass. From here we drive to see another entrepreneurial story, but this one is on a much grander scale. Again the business is owned by a family. The grandfather, back in the forties and fifties had a small business making litters for the tribal chiefs to be carried on. The Chiefs would always want a new design that would outdo the neighbouring chiefs. One morning, Grandad woke up with an idea. If the tribal chiefs want to travel on these ornate litters, why not try and sell them the idea of making their final journey in an equally ornate coffin. 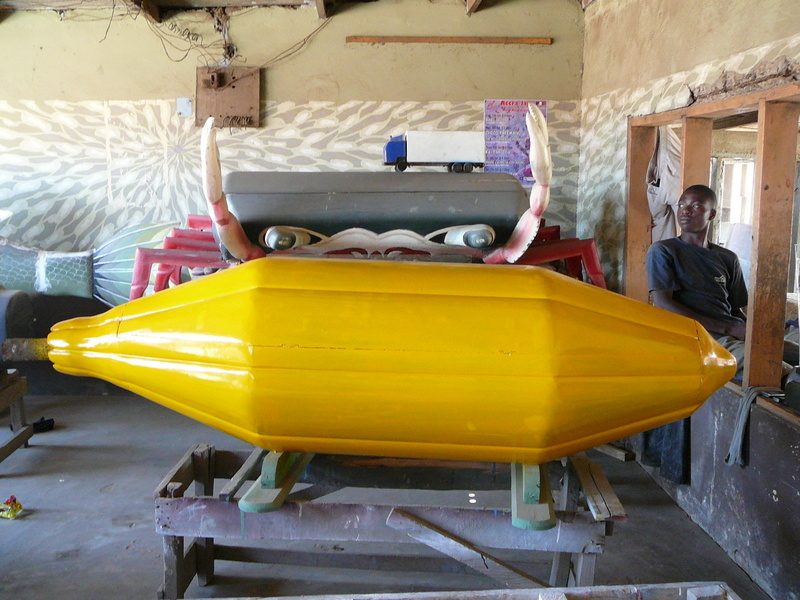 The rest is history This is the famous coffin maker of Ghana. The son of Grandad continues the business ably helped by his son. The grandson’s name is Eric. He is fluent in English, literate and well educated. 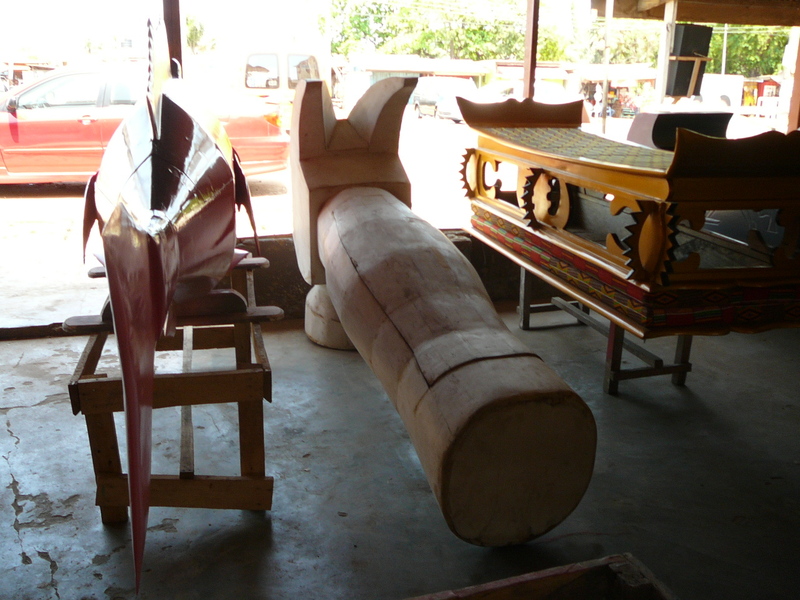 He has traveled the world giving demonstrations of coffin making, and appearing on TV wherever he goes. 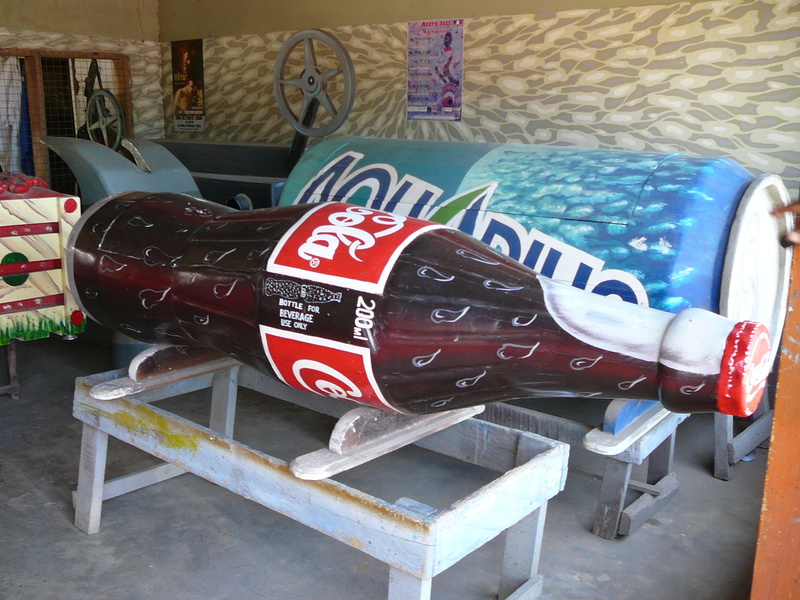 He now has coffins in many museums, from Los Angeles, to Oxford, from Russia to Taiwan. The list goes on. All of this comes out of a very small shop with just a handful of workers. There is no office, but they do have the perfect place for a relaxing lunch break. Ghana is definitely not one of my favourite places but the visits were. 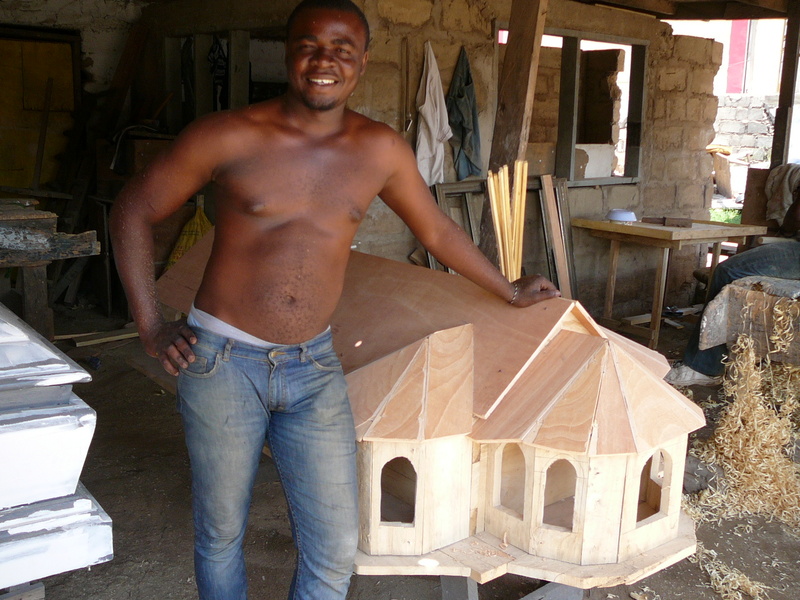 This entry was posted in Coffins, Ghana. Bookmark the permalink. 4 Responses to Thursday so it must be Ghana. I am reading these in reverse since meeting you at Frank and David’s. 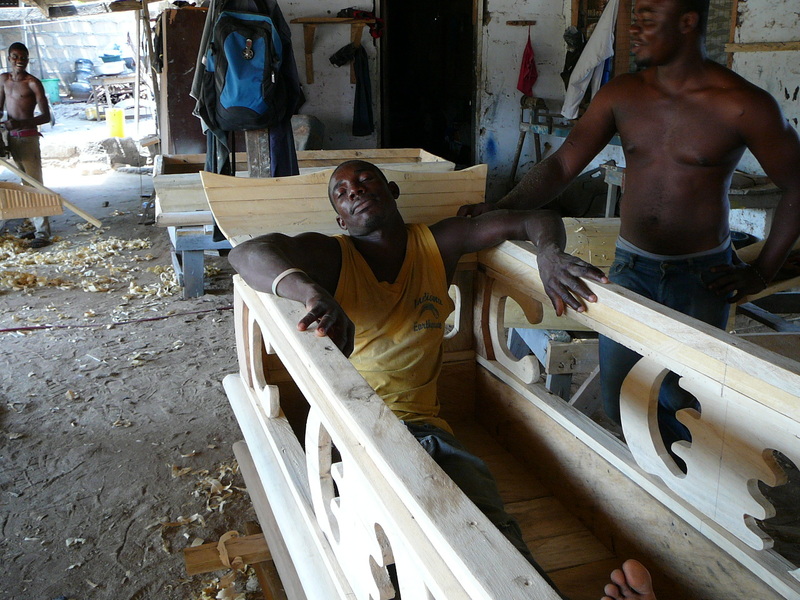 The bespoke coffin designer/makers is a very cool story. Thanks. Do you do everything backwards?! !